That said, there are times when critiques can be helpful, I think. I myself, as a [really, really, teeny-tiny] small-time indie visual novel writer(? ), appreciate all sorts of comments, especially the ones that point out what went wrong in my work and how I can improve on them for next time. 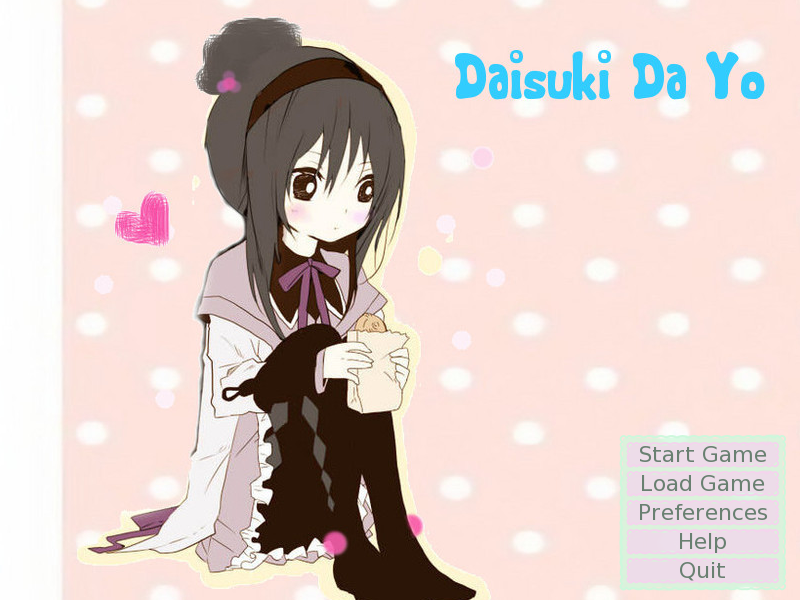 Anyway, I'm here to review an otome game, Daisuki Dayo ~in spring~, by mitsukeru73. 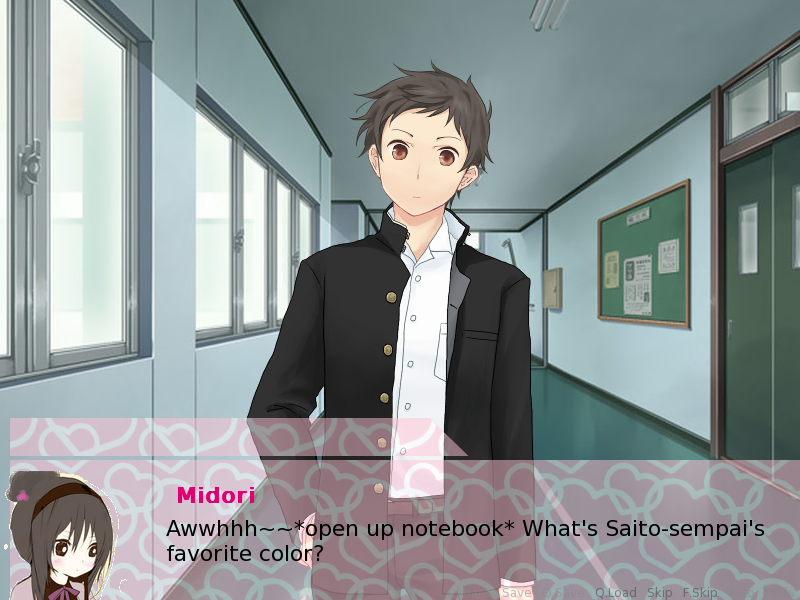 A girl named Midori Aichi has a crush on a guy named Saito-senpai, who doesn't really know her. 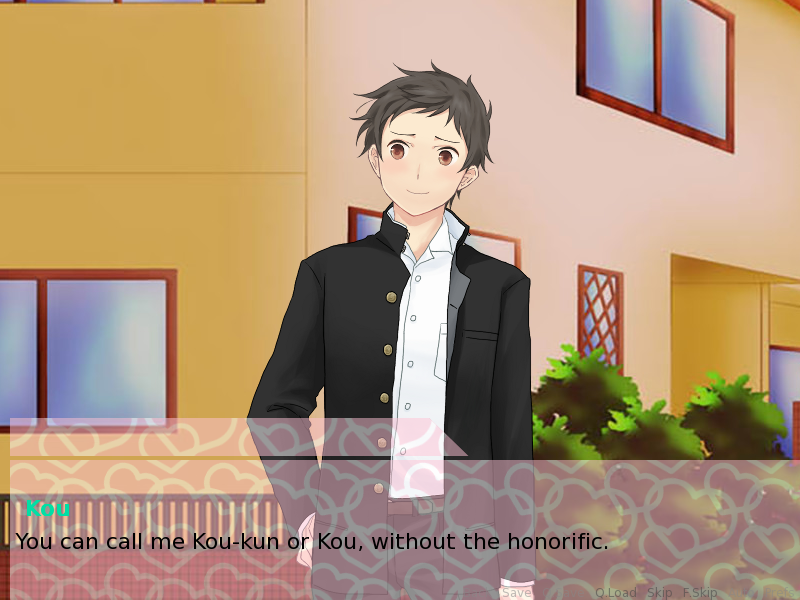 Another guy, Kou, who knows Saito-senpai, enters the picture, and... well. It's an otome game, so of course, a love triangle is bound to happen! - there are some scripting issues. - writing is... not so good. I want to focus on the positives first. And really, the first thing I can think of is the art. The backgrounds and the sprites are actually pretty nice, even though they're all just stock art. I think only the art for the protagonist, Midori, is original, but I'm not so sure either. But even that is quite nice, too! This game has no soundtracks (I think there's one, but it's mostly just silence you hear), but there's one song used in the endings, which is also very cute. And... that's about it. Brace yourself now for the rest of the review. Like I said, I hate to be blunt, but the writing in this game was quite bad. There were plenty of grammar and spelling errors, and if those weren't enough, the dialogues between the characters were quite awkward, mostly because of the writing style. Choices don't always seem to make sense, as well, like they were just placed there for the sake of having choices. I don't really want to spoil you on anything, as it's a very short game, but most of the choices in the game lead to very unrealistic scenes. I'm not saying that otome games have to be very realistic, but it's hard to suspend your disbelief when [spoiler] the protagonist gets to have a kissing "battle" with her crush on the first day they meet each other. Like... what the *toot*?! There's minimal voice acting as well, but, to be honest, the occasional voice was quite... um, annoying? It's obviously recorded using a low quality recorder (like a phone) and not good at all. I don't have anything against voiced VNs; as a matter of fact, I love them, but I consider voice acting as just a bonus. Either the voice acting is good, or you just don't put any voice acting at all. That's my personal belief when it comes to them, and I guess Daisuki Dayo pretty much disappointed me in that aspect. 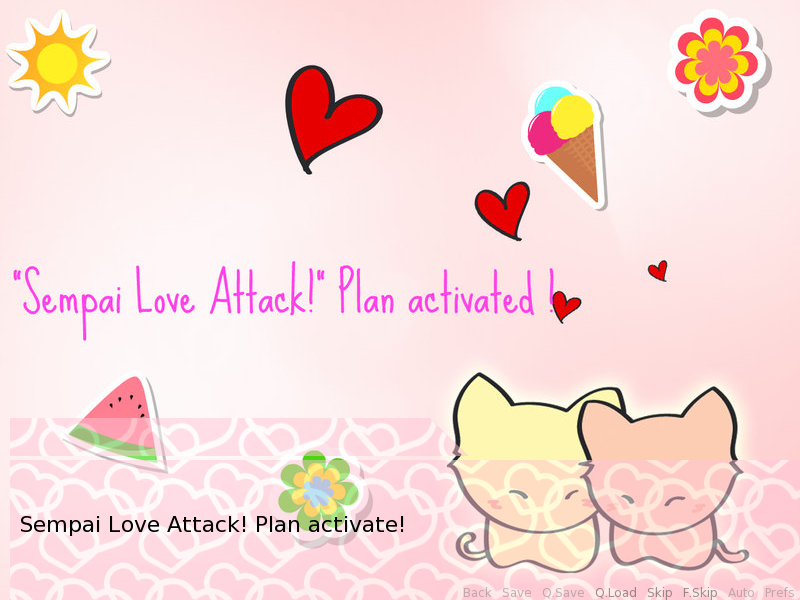 The game is really short, and there's no need to save and load anywhere, so... hahaha. So please, for your sake, don't try to left click on the game to pull out the menu, because it will just crash and burn. Okay, just kidding, it'll just crash. I don't know what's wrong with the programming, but the menu screen just doesn't work. Despite everything, though, I think the characters themselves were pretty interesting, especially Kou. And, yes, obviously, I went after Kou. <3 He's pretty cute. Hahaha. I would have loved to get to know him better, maybe if he was written a little better. To be absolutely honest, I find the game really cute. The story is super simple, and I have to admit that the writing really just isn't good, but I'm thinking that it's got some potential to it, you know? 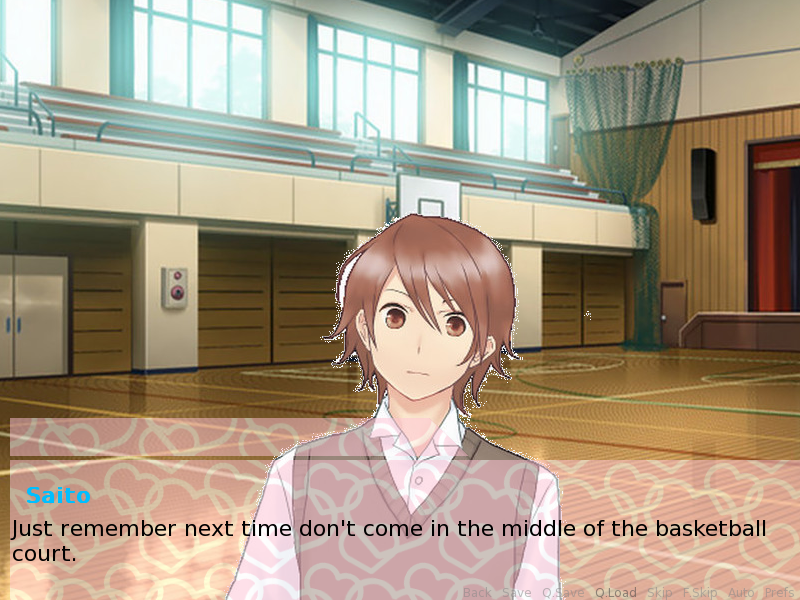 Or maybe I just like it because I totally blushed at Kou's ending, hihi. <3 Just kidding. Hmm, I don't know. But it's cute, if only the writing wasn't so bad.